The site lies at the tip of one of the most busiest and strategic road junctions in Haridwar. The triangular profile of the site instigated us to choose triangle as a module and organize inside spaces triangular in form. 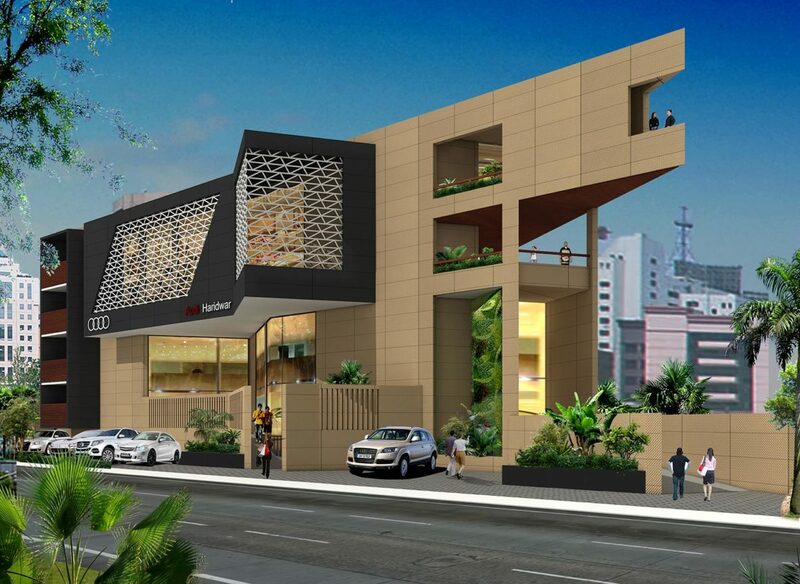 It offers a car showroom on ground floor and first floor with services in basement. Transparent vertical car movement within the showroom has been kept at the junction to generate a point of interest for onlookers in the mundane mechanics of vertical car lift. The second floor offers a restaurant, a balcony and a roof-top café for visitors to spend some leisure time in evening and engage themselves with building and city life. The tip of the site has a deep triangular terrace cantilevered for owner office on top floor and also to entice and invite people from a far-off distance.